Anthracite coal miners emerging from a mine, Scranton, PA, circa 1900. 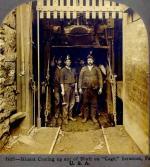 Few occupations in turn-of-the-century Pennsylvania were as dangerous as coal mining. Especially in the northeastern anthracite district, workforce pressures for increased production led to unprecedented accident rates following the Civil War. With the arrival of hundreds of thousands of immigrant laborers in the 1880s, the problems of mine safety were made worse by a growing segment of the unskilled labor force that was illiterate. What good were mine regulations if workers could not read them? 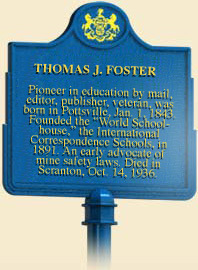 Herein is the origin and astounding success of Thomas Foster's mail-order school for miners and other industrial workers. What began as an advice column in the pages of Colliery Engineer and Metal Miner, a mining journal published in Shenandoah, evolved into the most successful correspondence school program in American history. 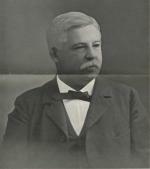 The magazine's publisher, Thomas J. Foster (1843-1936), advocated better working conditions and more modern mining techniques. Beginning in 1891, Foster also championed a form of practical and affordable education for industrial workers that encouraged safer work habits while offering miners a chance to improve their lot in corporate America. These early columns evolved into America's first mail order school. Over the next half century, more than four million workers enrolled in the more than forty different courses in industrial education offered by the International Correspondence Schools (ICS) headquartered in Scranton. Foster built the nation's largest school by discovering an untapped market, blue-collar workers eager to improve their lives. His was a common sense approach that did not duplicate the loftier ambitions of schools promoting character development and moral progress as part of the curriculum. As conceived by Foster, the ICS mission was to provide "practical men with a technical education, and technical men with a practical education." It was an ideal credo for the mass of factory and mine workers who never completed high school, or attended college for that matter. At a time when more and more Americans came to view education as the pathway to security and a better standard of living, ICS courses offered a practical alternative that opened the door to job advancement and an improved socioeconomic status. "Our courses are all prepared from a utilitarian standpoint," the ICS advertisements explained. "We are not aiming to train the mind, but to give the student such information regarding the principles, theory and practice as he can use with the position he is aiming to fill." 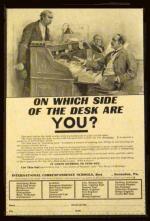 One popular ad posed the simple question, "On which side of the desk are YOU?" The accompanying image juxtaposed a downtrodden laborer and a smartly dressed office manager. The caption drew the obvious distinction between someone who worked with his hands and someone who worked with his head. Knowledge, asserted the caption, was the difference. Mathematics and geometry, the principles of electricity, drafting, and, in time, mechanical and chemical engineering courses were among the most popular mail-order topics. Courses in secretarial skills and office management were hugely popular. Most students began with the basic level of instruction and worked their way toward more advanced and sophisticated subjects. In time, the ICS curriculum expanded to include instruction in architecture, railroad and automotive technology, and even foreign languages. At its height, the company offered more than 200 different mail order pamphlets in its demand-driven curriculum. The tuition was reasonable and the innovative installment plan allowed pupils to make payments over time. 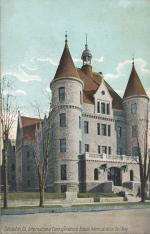 For example, in 1906, the typical course cost $100, payable over several months" time. Foster's timing, like his product, was ideal. Beginning just as the wave of millions of southern and eastern European immigrants entered the country, the ICS program grew at a rate of several hundred thousand new students a decade. Foster took his Scranton-based school to his audience, establishing a network of cooperative sites across the country. By the eve of the Great Depression, with more than 300 correspondence schools now competing in the market, the ICS had transformed the face of industrial and home-bound education. Even universities had taken notice, creating their own extension programs and evening divisions to appeal to the working population. The International Correspondence Schools still operates under the name Penn Foster, an internet-based distance education institution that emphasizes a "career-oriented" and "hands on experience with today's technology." According the to school's official count, more than 13,000,000 students have enrolled in courses over more than century of continuous instruction. James D. Watkinson, "‘Education for Success’: The International Correspondence Schools of Scranton, Pennsylvania," The Pennsylvania Magazine of History and Biography 70 (October 1996): 343-369..